What are your favourite aspects of the New York lifestyle? The diversity and the energy that New York City has. There’s so much to do and to take in, and there are people from all different backgrounds: culturally, racially, tourists, born and bred New Yorkers. It’s a melting pot. Some people say it’s a 24/7 city - whatever your mood or your vibe there’s always something to do or discover. Not a lot, but I hope to come here a lot more, soon. I went to London when I used to model, and for vacations and visiting friends. I love to hop on a plane any chance I get, and London’s so close. It just so happens that I haven’t been to London recently because I had two children, but now they’re old enough to visit with me. How do you think London’s social climate compares to New York’s? As I haven’t been to London for a while, I don’t want to pass judgement. But I think that London and New York both share the qualities of being forward thinking, especially when it comes to the green and vegan movements. You can’t walk more than two or three city blocks in New York without coming across a vegan restaurant. That’s something that you maybe don’t see in other cities, possibly because those social awakenings haven’t reached a critical tipping point yet. London and New york are both very fluid environments. People are accepting of other people’s backgrounds, they don’t seem to diss you if you’ve got an accent. We’re all here for a reason, and it’s the city itself that unites us. However, there isn’t yet a state of perfection. I think this is what we’re working towards as a goal. Have London or New york reached the epitome of true equality? I don’t think so, but we’re all trying to get on with each other and do the best that we can. How can a fragrance brand contribute to social issues such as diversity and equality? A lot of fragrance brands just focus on the juice, and that’s wonderful, but who are you as a fragrance house? What do you stand for? I think that having something to stand for, whatever that is, and being vocal about it is so important. Instead of seeing the same sales message on social media, people want to know what else you believe in. That’s an approach that you can take when you’re a lifestyle brand, as we are. We want to share a lifestyle of New York city, and that lifestyle has a certain ethos to it. I think if more fragrance brands did it that way, it might help elevate awareness on some issues, but certainly it’s up to the individual to take that ethos and pull it forward into their lives. Who is Kierin NYC collaborating with? We believe in working with up and coming artists. While we had the opportunity to work with some more established players, we like to work with people who are on the rise because they have a fresh perspective and modern approach, like we do. We have a limited edition release next year that will be a collaboration with a local graffiti artist. And we’ll be creating two regular additions to our collection with fragrance stories about New York city and new expressions of the city vibes. 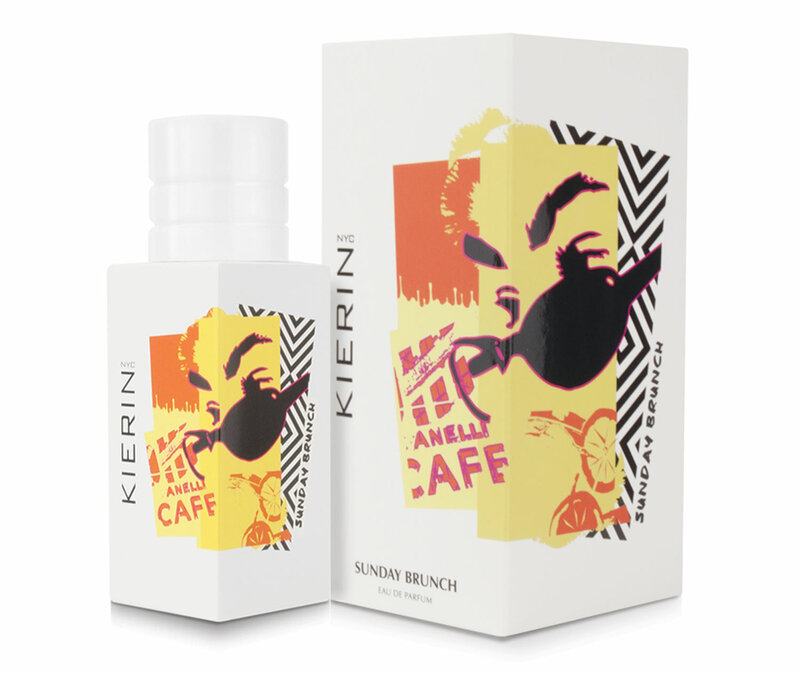 How do you feel about scent layering and would you layer the Kierin NYC fragrances? We’ve created each scent to stand on its own; they’re not specifically designed to be layered. But we also believe in individuality and making the brand your own. So if you had two fragrances and you think they smell fabulous together, well then go for it. But we’re not a ‘lab’ which creates single scents which pair formulaically. Mathieu Nardin is a very renowned perfumer who has created these scents, and the composition of each scent is in itself whole. So you don’t need to layer them simultaneously. But I could definitely see layering in the sense of wearing different scents for a different part of your day. What’s a good spot for brunch in New York? There’s so many different places to go for brunch. It’s pretty expensive to rent in the city and there aren’t many people who’ve got 2,000 square foot lofts to invite ten friends over for brunch, so as urbanites we not only live in our apartments but we also live in our cafes, restaurants and our city parks. Throughout my years living in New York, there have been many ‘it’ locations. And each one was sort of our living room or dining table. So you pick a hotspot, and then after a while you find a new one. But there are just too many cool, fun cafes, each for their own reasons. I would never want to single out one. Find out more about Kierin NYC here.